LPDA-A0098 is a medium gain directional LPDA antenna with a clever wire element design for EW applications covering 20 - 100 MHz at 1 kW of power handling. LPDA-A0098 is constructed using patented wire antenna technology. Tension is maintained in the antenna elements by means of a non-conducting tensegrity system that is deployed at the back of the antenna. 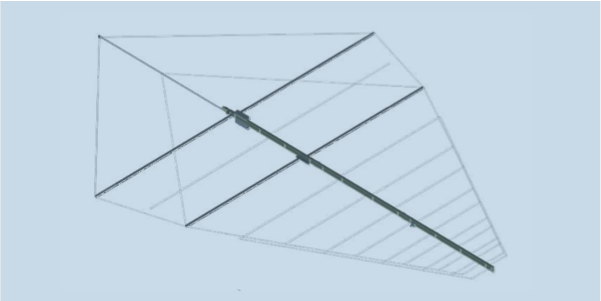 The tensegrity system folds away next to the boom of the antenna during stowage.This makes the antenna lightweight and allows for compact storage, quick, easy deployment and mounting. Polarization is adjustable between vertical and horizontal without lowering the mast. All antenna elements are permanently attached to the boom, to prevent any parts from becoming lost in the field.